The Invite Groups to folder setting does not supercede other folder collaborations restrictions and is only applicable for enterprise and business accounts. If this feature is enabled, end users can invite groups (within an enterprise) to a folder owned by the same enterprise. The folder and the group(s) must be part of this enterprise. Hover on the folder you want to share, click Share and select Invite Collaborators. You can also right-click and select Share, then select Invite Collaborators. In the Invite field, type the group name and see the auto-complete group list. If you transfer a group-collaborated folder outside the Enterprise, all group collaborations will be removed. For end users to invite groups to a folder in your enterprise, your enterprise admin must check the Enable group invite check box in the Admin Console (Enterprise Settings > Content & Sharing > Collaborating on Content section) to allow end users to invite groups (from non-admin pages). This setting is enabled by default. Admins have granular control over who can invite individual groups into shared folders. To allow end users to invite a particular group into a shared folder, navigate to that group's settings in the Admin Console (Users and Groups > Groups > Select a group). Click Edit in the Details section, and ensure that "Company" is selected under "Permission Setting". 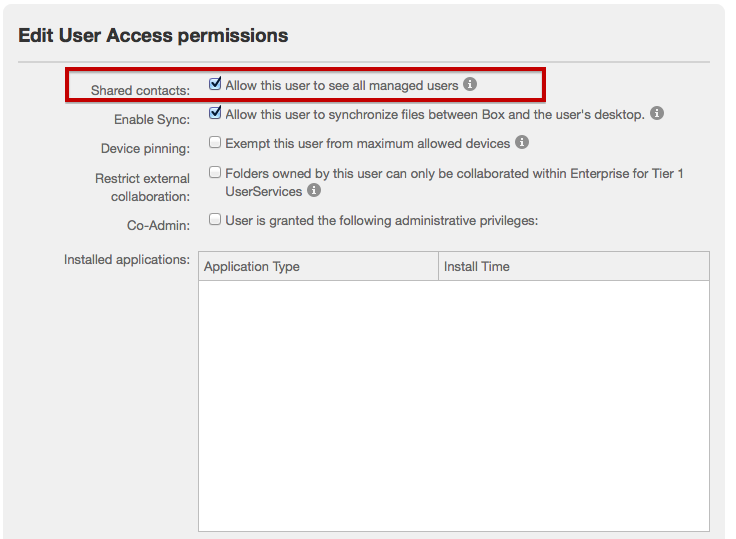 Your enterprise admin must also check the "Shared Contacts" check box in the Admin Console (Users and Groups > Managed Users > Select a user > Edit User Access permissions section). This setting is enabled by default when a new user is created, but can be enabled/disabled on a per user basis. Sharing and Collaboration - What Changed?